Moura and Korman had been trading jazz and Brazilian music for some twenty years, mingling Pixinguinha with Ellington, Monk with Gnattali, and Gershwin with Jobim. One night they were having a beer in a botequim downtown Rio de Janeiro. Conversing about the source of their sound. Some ideas came up: The sound of the city. The sound of Rio.The sound of New York. “It’s the sound of dance.” Paulo finally announced… “Samba?” Cliff asked. “No. Gafieira.” And they were off to the mythical hall of Estudantina. ThereGafieira Dance Brasil was born, a tribute to illustrious composers, to flamboyant dancers, to a city of tropical and architectural splendors, to nameless, penniless, and pleasure loving patrons. To most of the international audience, the words “Brazilian music” conjure up images of samba and carnival, the suave tones of the Girl from Ipanema, and more recently the spark of Tropicalia and Axê music.. But there is a music that remained hidden in the heart of the old city of Rio and treasured in the soul of the Brazilian people: Gafieira. Remember the swing era in New York… Stompin’ at the Savoy… Ten Cents a Dance at Roseland, the times when popular dance and popular music were one, and the flavors of the world were brought to the band-stand as well as to the dance-floor. Then move it to Rio and imagine: decadent baroque, luxurious palm trees, people who come from prodigious mixes, from all walks of life, wood-furnished halls, tiny bandstands, nosy bartenders , traffic of cervejas and caipirinhas , and above all, the unbelievable jamming of the greatest musicians in town. 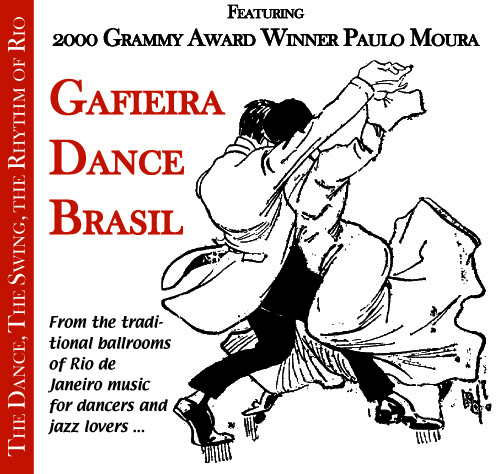 The term “gafieira” was coined at the beginning of the 20th century to describe the dance halls of the working class neighborhoods of Rio. As years passed, the music played in those ballrooms came to reflect a wide diversity of musical influences, including Afro-Brazilian samba and choro rhythms, French dance forms, Argentine tango, and North American big-band music. At a time when the social structure of Rio was sharply divided by economic and racial definitions, the gafiera halls became something of a common ground, a meeting and mixing place where music overcame these boundaries. In the 1930’s, “rules of the house” were enforced, including a dress code and a behavior code (no smoking on the dance floor, no extended or scandalous kissing). The gafieira band, whose origins included guitar, cavaquinho, flute, and pandeiro, evolved to include trombone, trumpet, bass, drums, and piano. And as a truly unique form of dance music developed in the gafieira ballrooms, the music itself began to be identified as “gafieira”.